There’s been so much talk about Obama’s upcoming trip to India. For people here, it’s both exciting and a nuisance – the same person who will marvel: “Did you hear that he’s staying in India longer than any other country he’s visited?”, will turn around and scoff “Doesn’t he have enough cultural sensitivity to not come during Diwali? Did you hear no one can use fireworks?”. At any rate, it’s certainly a topic on everyone’s minds – and as an American I definitely hear all the opinions in the peanut gallery. So when a friend asked me if I would be willing to sit on a panel about youth opinions on Indo-US relations, I agreed. After all: I had lived in Britain when George Bush was president. How much more hatred could I receive as an American than I had during that time? Wouldn’t it be fun to get back to the roots of my International Relations degree? 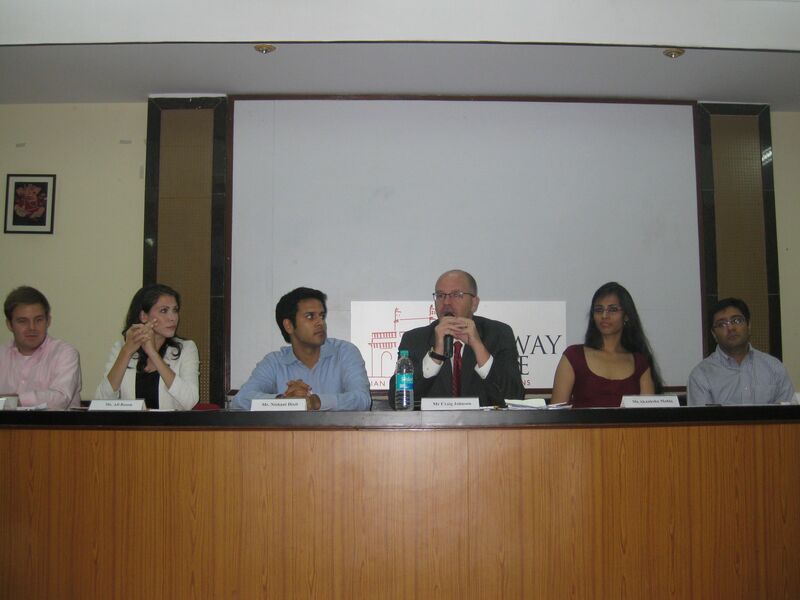 The panel was being held by Gateway House, a think tank in Mumbai. As the time of the panel got closer I started to worry that maybe I’d agreed to something a bit larger than I had expected. I found out that the content of the panel’s discussion would be used to frame a paper on what the new generation of Indian and US professionals feel should be discussed by Prime Minister Singh and President Obama. The paper would then be presented to the US Consul General to pass along to President Obama. No pressure there. Then in the run up to the panel the Times of India ran a promotional piece. I just hoped that I wouldn’t make our American side look completely inferior. And overall, I actually think it all went pretty well – by the time the audience question time had arrived they were all raring to jump in and ask us our opinions and the dialogue felt real and genuine. I think everyone on the panel had gotten over their initial nerves and thoroughly enjoyed the opportunity to speak about the issues facing the US and India. And who knows- maybe the paper will make it into some important hands. Or not – either way, I at least enjoyed a chance to be part of the dialogue in a small way. (Also: If anyone is interested, Gateway house has posted portions of the discussion online (I’ve included Part 1 below)). Ali, You did well-that was challenging! We are proud of you! I saw the discussion on line. You did very good.